The process described on this page was used in a study directed at coral reef preservation published in Hydrobiologia 474(1): 67-79; 2002. A Malaysian coral-reef area of 114 hectares in was video mapped in six hours, a reef mapping rate that matches those currently achieved only with air-borne imaging devices. However, this methodology results in completely ground-truthed data that can be classified according to many schemes by direct observation of the habitat, and provides detailed bathymetric data that satellite imagery or air-borne spectrographic sensors do not provide. The method can be used as a stand-alone reef mapping and classification tool on the scale of tens to hundreds of square kilometres. Details on creating cables to connect the echo sounder, GPS, etc to the PC. Skip this section if your instruments are supplied with ready-made serial connectors. Map plotting software For example Surfer from Golden Software, or if your needs are less demanding the cheaper 3DField. It is assumed that two serial COM ports or more are available on the PC. If the data output cables for the instruments (echo sounder, GPS, etc) are supplied with ready-made serial connectors for the PC, this section may be skipped. Otherwise, a serial cable must be purchased and soldered to output cables according to the procedure below. Whether to use a 9-pin or 25-pin serial cable is determined by the PC's socket, but otherwise does not matter for connectibility with the peripheral instruments (in any instance, only two pins will be used). A single serial cable with female connectors in both ends can be cut in two to provide a PC connector for two instruments. It must be possible to open the connector covers. This permits inspection of pins and wire colours so that the relevant wires can be identified easily at the cut-off end. Consult the instrument's user manual to identify the colours of the Rx (data out) and SG (signal ground) wires from the instrument. Open the cover of the serial cable's connector. If the computer has 9-pin serial ports: identify the wires belonging to pins 2 and 5. In case of 25-pin serial ports: identify the wires belonging to pins 3 and 7. The pin numbers are usually printed on the cable connector's front. In any instance the pins are numbered consecutively from right to left, starting with the top row, facing the end of the cable connector. In case of 9-pin ports: Solder the instrument's Rx wire to the serial cable's pin 2-wire and the SG wire to the pin 5-wire. In case of 25-pin ports: Rx to pin 3, SG to pin 7. Insulate the connections and give them a splash-proof cover using strong tape. Repeat 1-3 for the second instrument. Plug each ready-made connections into its serial port. Note: Static electricity builds up in a moving boat and can destroy your serial ports. Therefore, provide careful grounding of your instruments. Consult the instruments' User Manuals for instructions. Connect as described above, and start the PC and the two instruments. In ComDebug choose to use the program as a Terminal Utility. Specify the COM port settings. You should consult the User's Guide for your echo sounder and GPS; but generally these settings will work with instruments that follow the NMEA standard. Baud rate: 4800; Bits: 8; Parity: none; Stop bits: 1; Flow control: Xon/Xoff or Hardware (you may have to try both). Click 'OK' to confirm. This connects you to the COM-port in question. If the wiring and port settings have been done correctly, you will see the data from the instrument in the Reply grid. This allows you to observe the data output rate of your instrument directly. Use a stopwatch and take note of the update rate; this will be useful for configuring the data logging software later. Repeat for the second instrument, using another COM-port. For convenience, label the instruments' cable sockets with the port number to which they are supposed to be connected. This will avoid possible connection problems later. In HyperTerminal, choose New connection from the File menu. You will be prompted to choose an icon (choose any) and to give a name to the connection. Name the connection according to the instrument, e.g. 'echo sounder' or 'GPS'. In the next dialogue box you are prompted to enter a telephone number. Ignore this, and note that at the bottom of this box is a drop-down menu that lets you choose whether to connect via a modem or directly to one of the COM ports. Click the drop-down menu and choose the COM-port to which the instrument is connected. Select 'OK' to proceed. In the next dialogue box you can specify port settings. You should consult the User's Guide for your echo sounder and GPS; but generally these settings will work with instruments that follow the NMEA standard. Baud rate: 4800; Bits: 8; Parity: none; Stop bits: 1; Flow control: Xon/Xoff or Hardware (you may have to try both). Click 'OK' to confirm. This connects you to the COM-port in question. If the wiring and port settings have been done correctly, you will see the data from the instrument rolling in on the HyperTerminal window. This allows you to observe the data output rate of your instrument directly. Allow the screen to fill with data, then save the file as 'GPS_test', or 'Echo_test', as appropriate. You will consult these example data for writing parse strings - i.e. rules for data identification and extraction - in Windmill later. When this procedure is finished, physical setup is complete and data input is known to be working. The download package is a single zip-file including several compressed files and small programs. It is assumed that the instruments are connected to the PC and that communication has been verified as outlined above. Start the Windmill program called ConfIML. This program defines new instruments and channels. The dialogue box Configure IML hardware appears. Select the Signal generator and click Remove. Click the Add button to define a new instrument. The Add IML hardware dialogue box appears. Select COMIML Serial Instrument handler and click Add. Click the Save button to close ConfIML. Run the ComDebug program and follow the instructions at the Getting Started with ComDebug and ComIML Serial Driver page. Create a new Instrument file and configure the Echo Sounder. When you have successfully obtained data from the Echo Sounder, create a second instrument file for the GPS. Reply parser: In this screen you will enter 'reading rules' that tell Windmill which characters to ignore and which to read in the text output from your instrument. Consult the sample data from the instrument (cf. step 8 above). A typical data string from an echo sounder might look like this: $SDDBT,22.3,f,6.8,M,3.7,F. First, there is an NMEA-type code ($SDDBT), and then, obviously, the depth in feet, metres and fathoms. (Thus, even this echo sounder can be set up with three channels, though this is redundant). Looking at such a string sample, write a parse rule that lets Windmill recognize and extract the right data. In this example, Windmill can search for 'f,' and extract the figures until ',M'. This would cause 6.8 to be extracted from the string and placed in the data file. Click Run to check everything is working. Save your settings. From the Main Menu select Save .IMD file. Windmill lists all your serial instruments as modules within a COMIML Device. To create a device: in the opening screen click Edit Windmill Device. Press the Add button and select your instrument files. Press Make IMS, enter a file name and click "Open" to save. This creates a "hardware setup file" which the other Windmill programs will ask for the first time you use them. You can edit this with the SetupIML program if you wish: setting alarm levels, renaming channels, changing the engineering units, etc. In this example it is assumed we wish to make a setup that logs depth in metres from the echo sounder and degrees north and east from the GPS. Start the Windmill program called SetupIML. This program lets you select instruments and channels for integrated logging, and saves this combination as a setup profile. The dialogue box Open setup appears automatically. Select Create new setup and OK. The dialogue box Setup IML - create new setup appears. Type a profile name, such as 'Sea-floor', and enter a brief description of what this setup will log. The settings for each channel can be edited by double-clicking the channels under the instruments' columns. If you want to receive data from a channel, Enable for input must be selected in the Usage frame in the configuration dialogue box (which appears when double-clicking on a channel in the Configure channels dialogue box.). When the echo sounder and the two GPS channels have been included and their configuration checked, choose Save from the File menu and save the setup as 'DLatLong' or some other name that indicated what the setup will log. This file will be saved with the suffix '.ims', e.g. as 'DlatLong.ims' in the Windmill folder. You are now ready to start data logging. Start the program Windmill Logger. Choose Load hardware setup from the File menu, and select the Sea-floor mapping setup (i.e. the ims-file you saved from SetupIML; cf. step 3 above). If something is wrong with this setup (or if your instruments are not connected) an error message is displayed: This setup file cannot be used with your current hardware configuration. It requires different hardware. (Typical errors pertain to the port settings.) If the instruments are set up correctly, the dialogue box Channel connections appears. Select the channels for depth, latitude and longitude, and click 'OK'. This returns you to the main Logger window. Enter a file name. The data will be saved in a text file in the Windmill folder with the suffix '.wl'. Use the Settings menu to specify how frequently Windmill is to read data from the instrument. There is no point reading more often than the update rate of the slowest instrument. Time stamps: choose real time or time since start. In the Options frame tick whatever is preferred, though indicate empty scans is useful for the data file (giving the entry 'Error 114'). Click Start and the echo sounder and GPS data should start rolling in. Mapping may start. When you stop logging, you can save the Logger settings and quickly restore them at your next mapping session. From the File menu select Save. Click Start, and begin collecting data. 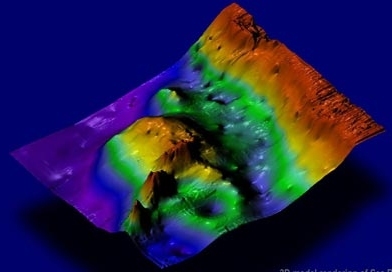 For 3D presentations of bathymetry, other dedicated software is required such as Surfer from Golden Software. When using Surfer you need to convert the latitude and longitude readings into decimal degrees, with West and South being shown as negative values. For example, a longitude of 5330.25 North is 53 degrees, 30.25 minutes (or 53 degrees, 30 minutes and 15 seconds). This converts into decimal degrees as Degrees + Minutes/60. In our example this would be 53 + 30.25/60 = 53.50416667. You can do this automatically in a spreadsheet. This shows a portion of a logged file in Excel. Columns C, D and E show depth, latitude and longitude data collected by Windmill. Columns A and B show the conversion to decimal degrees. The conversion formula is shown at the top of the picture. "LEFT(E3,2)" extracts from cell E3 the 2 leftmost characters (88). "MID(E3,3,7)/60" extracts 7 characters from cell E3, starting at position 3, and then divides this by 60 (29.2115/60). Whilst logging in the boat, the computer needs to be kept dry. A cheap way to do this is to run Windmill on a laptop and transport the PC, the instruments and a small 12 V dry acid battery in a plastic box with a tight-fitting lid. The sonar transducer and GPS antenna can be mounted on a pole and temporarily attached to the boat's stern. The system can be set up or removed in a few minutes. You can combine the basic mapping with a video camera in an underwater housing. Start each mapping session by filming Windmill Logger: the data file's exact start time is now on tape. When mapping is complete, film the close of the data file. To speed up video classification transfer the tape to CD-ROM in MPEG file format. This inexpensive service is widely available. The video can then be played back using the Media player which is supplied with Windows software. This means you can view the video whilst having Excel (for example) open, making it easy to enter classification data into the spreadsheet. Using single letter codes for habitats and Excel's fill-down feature between habitat transitions, information obtained from video footage can be entered extremely quickly. Distribution map of different coral types. The coral distribution data was added from video evidence after the generation of the contour map. The image shows just three broad categories of sites with a very clear dominance by branching, massive or tabulate coral. Soon posters will be on display at the new Visitor's Centre in Perhentian Marine Park, comprising tens of thousands of manual seabed evaluations based on video recordings posted on the maps.